The May Sinclair Society was contacted last year by a Lionel Guilbert, of Florida, who was in the process of renovating a 1930s Rolls Royce, and wondered if the ‘Mrs May Sinclair’, of 16 Cavendish Street London who was named in the Rolls Royce archives as the first owner could possibly be our ‘Miss May Sinclair, novelist’. 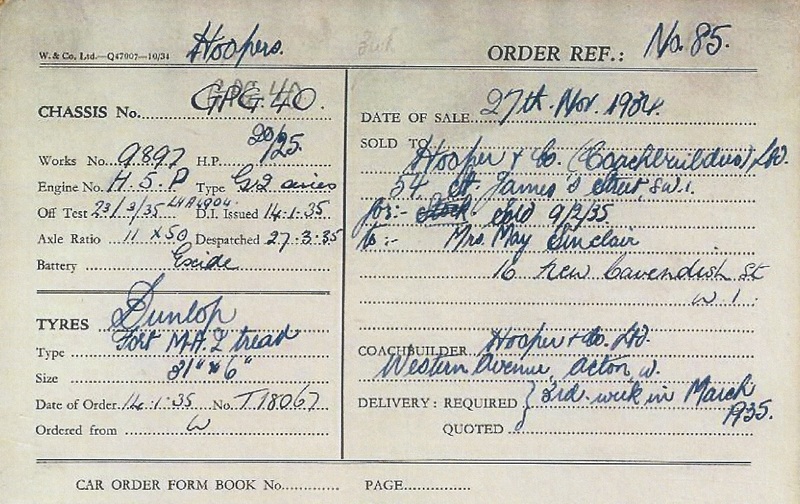 The order receipt, with the name of the first owner: ‘Mrs’ May Sinclair. Was this May Sinclair’s car? In 1934, Sinclair was living at Pembroke Cottage, Little Tingewick, in Buckinghamshire, with her maid and companion, Florence Bartrop. She moved to the Gables, 96, Burcott Lane, Bierton in 1936, where she died in 1946. She first acquired a car in 1919 and continued to own one until her death in 1946. May Sinclair loved being driven around by her chauffeur, Ernest Williams, and she, Florence and Ernest took at least three extended trips in the 1930s, one around Wales, one around Yorkshire, and one to the Isle of Wight. 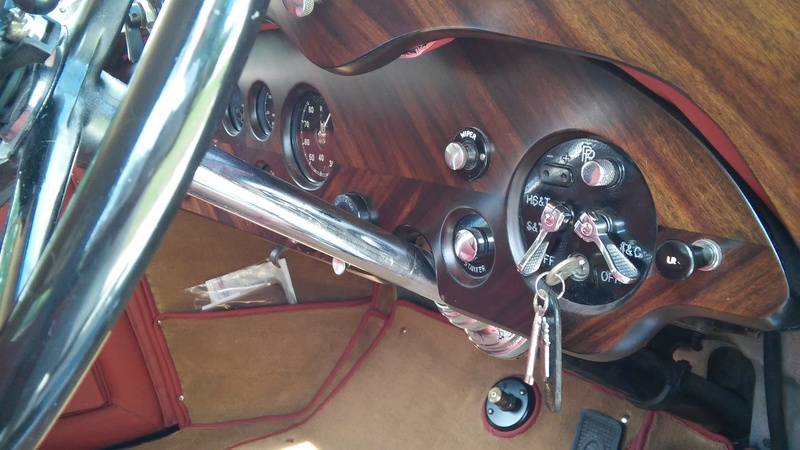 May Sinclair’s particular pleasure was to be driven very fast, because, according to her doctor, the shaking of a speeding car made her less aware of the tremor caused by her Parkinson’s disease. She also liked the feeling that she owned the road: her first biographer, Theophilus M. Boll, recounts how she would beg Ernest to overtake any vehicles they saw in front of them. We have so little information about Sinclair’s life after her retreat from the literary spotlight that it is impossible to say for sure, but it does seem likely that this Rolls Royce did indeed belong to her. “Tom lived in Rochester, NY when he bought the car in 1974 after seeing it, driving by a gas station on his way to get ice cream. It was for sale in Montauk, Long Island, NY. He contacted the owner, a NY doctor, and flew back to Long Island to pick-up the car and drive it back to Rochester, at night, in the rain. He told me that was a challenge, as the wipers on older cars are not the most efficient ones . . . This was the first car to his current collection of about 25 cars, including 2 other Rolls, one Bentley, three Ferraris, Aston Martin, Jaguar, Corvettes and others. He showed the car at various shows in the NE but never had the time to restore it fully, only giving it a new paint. It was in a pretty rough shape, its original folding leather roof having been replaced with a permanent plywood roof, and its interior leather and carpet in poor condition. One thing Tom keeps mentioning however is how reliable the engine has always been, and to this day, it starts on the first crank. As Tom moved to Florida in the late 1980s, he left the car in upstate NY inside a friend’s barn, The car stayed there for over 20 years, where moths and mice proceeded to eat away at the wool carpet and horse hair used in the seat cushions. We moved the car to FL in 2001 and kept it in a climate controlled garage since then. 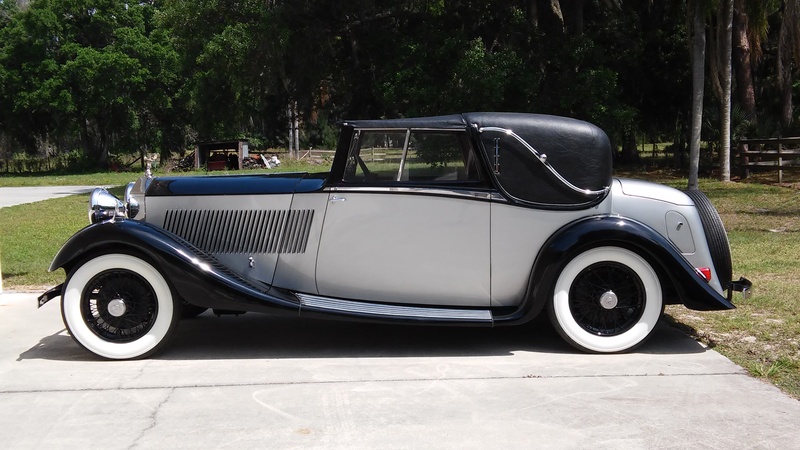 We started the restoration last March, in prevision for the US’ Rolls Royce Owner’s Club annual meet that takes place in Orlando, FL nest week. The car is ready. We worked on the engine and chassis mechanicals first, then began the cleaning process to remove 80 years of accumulated dirt and grease. 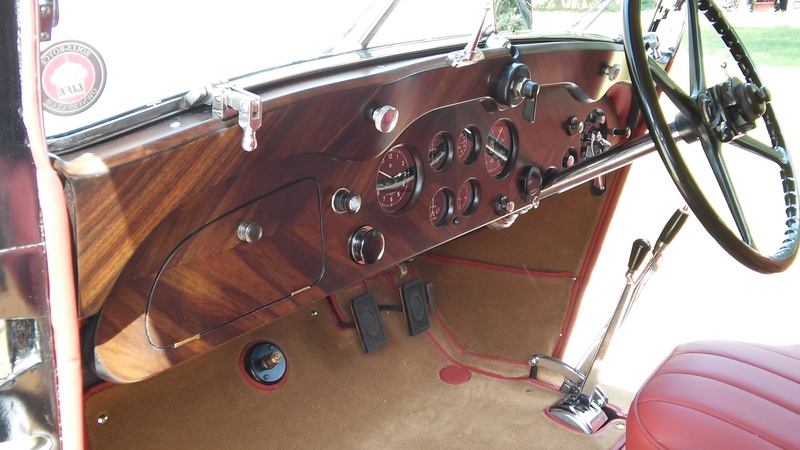 We removed the fake roof and commissioned a wood worker to re-create the rotted wood frame for the original roof line, and refinish the delicate interior wood dash and door trims. 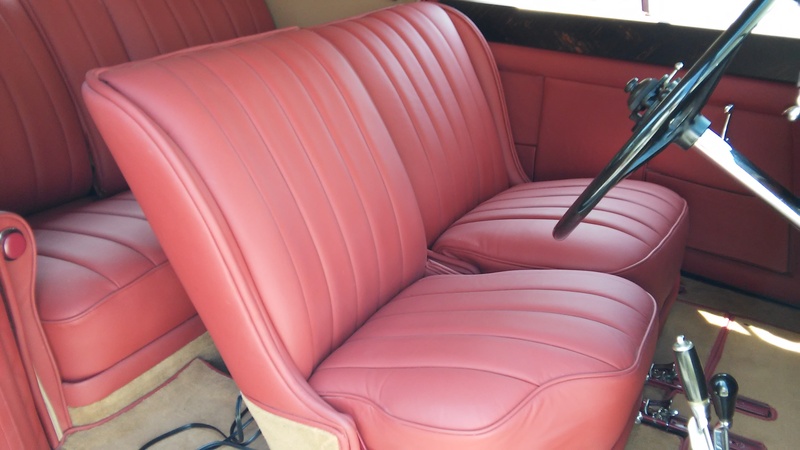 Some interior items like turn signal system, side windows cranking mechanism, seat tracks, tool trays, floor boards and trunk compartment were worked on prior to taking the car to the upholstery shop where it remained 4 months. I redid some parts of the paint on the body, repainted the complete undercarriage, engine and engine accessories, polished the aluminum and chrome parts, installed new tires and exhaust system, and re-created the folding front roof support frame and hinges, and a myriad of other small details. The doctor in NY owned the car for several years prior to Tom. Over the years people told him they remembered seen this Rolls in NY City many times. The doctor used to tow his small boat on Long Island with the car as well. The doctor bought the car from Scotland, where it is believed the roof got replaced, and one more owner had custody of the Rolls between the doctor and May Sinclair. 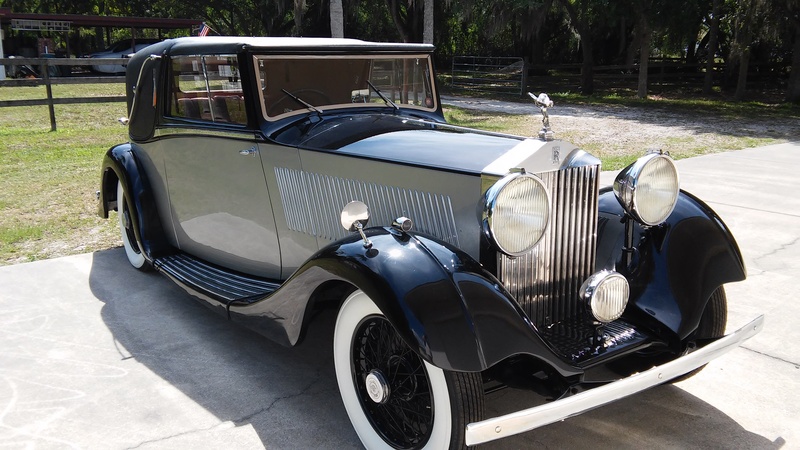 Factory and Rolls Royce historical records show that May bought the car new in 1934 and kept it until 1938. The whereabouts of the car during WWII are unknown, until the doctor brought it from Scotland to the US. The car is in good hands now and in good company”.